Click Here To Visit The North West Swan Study Page. The Mute Swan is a well known bird in the British Isles, often frequenting public parks, and being tame are a favourite with people of all ages who like to feed them. This tameness has found them a special place in the hearts of many people in Britain, thus ensuring that it is treated with fondness and respect. The Mute Swan is one of 7 species of swan worldwide and is the largest British bird. Adult females weigh around 9kg, with males around 11kg, although weights of up to 15kg have been recorded. 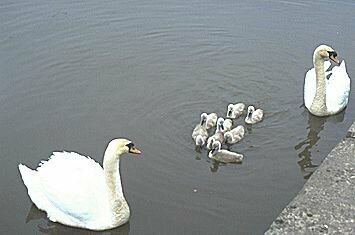 The Male is known as a Cob, the female as a Pen and the young as cygnets. British Mute Swans are normally found in low lying areas and are are fairly sedentary, Movements of over 100 km being uncommon due to the general availability of food. In some other countries they do migrate considerable distances in search of food during the winter months. For many centuries, Mute Swans in Britain were domesticated for food, with individuals being marked by nicks on their webs (feet) or beak to indicate ownership. These marks were registered with the Crown and a Royal Swanherd was appointed. 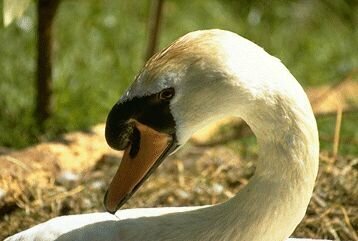 Any birds not so marked became Crown property, hence the swan becoming known as the "Royal Bird". 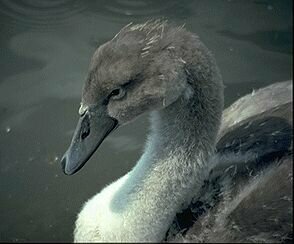 It is quite possible that this domestication saved the swan for being hunted to extinction in Britain. The swans were rounded up at a swan-upping, and although they have not been kept as a food source since the beginning of this century, the tradition is still practised by The Worshipful Companies of the Vintners and Dyers on the River Thames in London. At Abbotsbury in Dorset there is a large colony of swans which has existed for 600 years with the swans being managed in a similar way as they have been for the last few centuries. As well as being a source of food other parts of the bird were used; feathers as quills for writing; the leathery web for making purses and wing bones for making whistles. 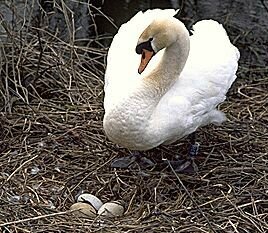 Mute Swans do not normally start to breed until they are at least 3 years old. Between March and May a huge nest is constructed, in which the pen lays a clutch of normally between 3 and 7 eggs (although as many as 13 have been recorded). The eggs are laid at 2 day intervals, with incubation starting with the last egg and taking 35 days. During the breeding season the male becomes very territorial and aggressive to any intruders. This behaviour has been known to extend to swans fighting to the death. They often threaten humans who venture too close to their nests while issuing a warning call (au.file), but, although they can inflict a painful blow with their wings, contrary to popular belief they do not bite. The cygnets will normally join flocks of other non breeding swans, especially during the moulting season in July-August when they moult all their feathers and for a short time become flightless. Over the next two years the immature swans may start to form a pair bond with a mate and will look for a suitable territory on which to breed. Mute Swans have been known to live for over 25 years, but most only survive to 5 or 6 years old. Many cygnets die in their first 12 months, often due to flying accidents. In the 1960s the Swan population in some areas of Great Britain decreased dramatically. Investigations into the causes of death revealed that a high proportion of birds were dying from lead poisoning. Many birds that were post-mortemed were found to contain lead shot, similar to that used by anglers, in their gizzards (a bird's stomach). It was assumed that swans were picking the shot up as they ingested the grit with which they grind down food. The lead, being soft, is ground down by the gizzard and absorbed into the bloodstream, causing muscular problems. This gives swans the appearance of having a kinked neck, as the muscles weaken and the bird is unable to support its neck correctly. One of the puzzling questions however was why after centuries of anglers using lead shot did the population suddenly start to decrease? One theory was that the quantity of lead shot discarded had built up over the years to a high level, this was not accepted by many anglers or conservationists. In their book The Mute Swan, Birkhead & Perrins suggest that it was due to the change in angling techniques and materials. Until the 1950s anglers had used cotton line along with a "hook length", a piece of catgut in turn attached to the hook, which was reused as often as possible. With the advent of nylon monofilament line, there was a greater tendency for anglers to discard the line between float and hook, to which the shot is attached, often into the water where it would become entwined in aquatic vegetation and could then easily be ingested by a swan whilst feeding. This seems a more likely explanation of the sudden increase in the deaths caused by lead poisoning. Indeed, in the few years prior to the banning of the use of lead shot in Britain, the number of lead related deaths in the North West decreased, possibly due to the growing number of anglers "pole fishing", whereby the nylon line is reused in much the same way as catgut was.